The Key Route Plaza mural was a large, colorful mural on what used to be part of a Key System station at Piedmont Avenue and 41st Street. The spot marks where the first Key System train arrived in 1904. The train in the mural is #159, which last left the station at 6:45 pm on April 20th, 1958. The mural is full of meanings, starting with the obvious, giant figure of F.M. "Borax” Smith, creator of the Key Route. 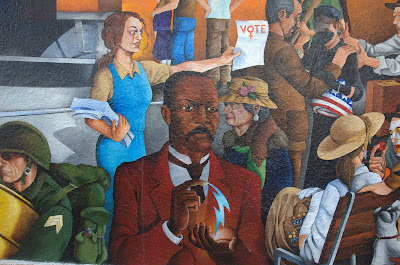 When funds ran low for the mural, the artist offered to depict donors to the project riding inside car #159. There are other figures of note through the image as well. Susan Svendsgaard and Taylor Fitzpatrick near train doors. Jane Hartman Adamé: My grandparents. He was a painter and she was a music teacher. He’s holding one of his paintings and if you look closely, she’s holding sheet music. After he passed, my grandmother had a gallery featuring his artwork and others on Piedmont Ave. The artist wasn't notified about the impending destruction of the mural. Whether or not the mural could have been saved, it was such an amazing mural that it would have been worth trying. The negative Yelp reviews have started coming in for Kronner Burger (even though it hasn't yet opened), mostly based on residents' anger at the destruction of the mural. Rocky Rische-Baird's phenomenal "Key Route System" mural, painted on the side of J's Hamburger & Such was not just an extraordinary piece of artwork. it was a loving homage to generations of Oakland residents that resided in and near the neighborhood. Residents who had relatives that worked on the Key Route System, residents that are third generation Oaklanders. 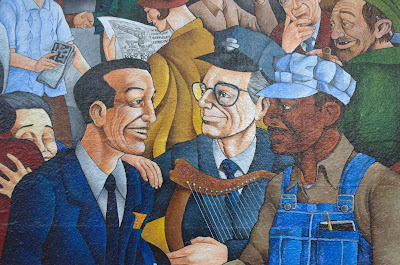 With a blend of ethnicities and residents from all walks of life, the mural showed the skill of the Oakland designers, laborers and visionaries who created the Key Route System. A positive work of historical beauty, the Key Route Line Mural is /was exactly what Oakland needs more of. Not less. The building is currently owned by Hal Brandel ** & other associates. Mr. Brandel also owns Cafe Trieste, immediately next door and Bar Cesar on the other side of Trieste. Mr. Brandel has certainly done well for himself in the bay area real estate scene and kudos' to him for being so successful. Success none the less, funded by the thousands of local residents and visitors that spend money in Mr. Brandel's establishments. No big story here. Mr. Brandel has a keen sense for business and has picked some key spots for investments, including Berkeley. But, it is Mr. Brandel's assertion that the Key Route Line mural had to be destroyed because it would have cost tens of thousands of dollars to repair/restore the wall behind it. Hmmm. Really, between Mr. Brandel, his associates and the new tenant, Chris Kronner they couldn't come up with the money for this project. Seems like a hard roll to swallow. 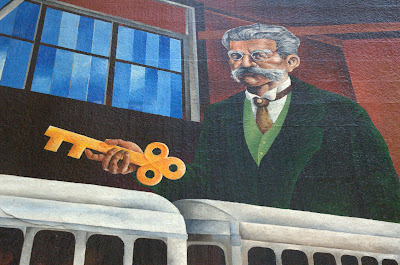 When Chris Kronner took over the old J's space he made the decision to destroy the existing Key Route Mural for financial reasons, rather than find an alternative solution that would keep the mural intact. The heart of the problem was supposed years of decay and black mold. Ok. But why wasn't the neighborhood and the artist that created the mural notified of the problem. The artist, Rocky Rische-Baird was not notified of the impending doom of the mural and was contacted after the fact by a concerned resident, not by Brandel or Kronner. *1. The deed was hidden by a "protective tarp". Such protection you should never know from. Apparently the offer of the local PANIL to start a crowd funding source of income to offset the cost of saving the mural was ignored by Brandel, Kronner, et.al. *3. There were many people ready to support Kronner/Brandel in finding a positive solution to the problem. But money, greed and duplicity won out. Kronner asserted that he tried everything he could to find a solution, but after his meeting with the PANIL he realized how "aggressively angry" the locals were and decided it was better to not go public with his plans to destroy the mural.*4. So he did so in a secretive underhanded manner. Not the best way to ingratiate your business to your new neighbors. Ok, so a hot, well, tepid San Francisco chef comes into a quaint little Oakland neighborhood with big plans for what his under construction web site so boldly refers to as Oakland's Burger Paradise. And he does not want to have a transparent public conversation about his plans to destroy a positive part of the neighborhood that he is moving into, because he realizes there is quite a lot of opposition to his plans. Duh! Is Kronner kidding, a business person in this era that doesn't understand the power of on-line funding. He never even gave the citizens of Oakland the opportunity to step up to the plate and raise the money to save one of Oakland's most important public works of art. Am I the only one choking on this point? Oh and in an effort to show some kind of Oakland cred's, Kronner states that his partner and business partner has lived in Oakland for twenty seven years. The fact that he is a fairly new resident himself cannot be pumped up by his associations. Where has HE actually lived and worked for the last twenty seven years? Well, he has been doing a pop up in Oakland since around March of 2014. Not that it matters, but if you're going to distort facts to make yourself look like a bigger part of the community than you are, well it raises questions of credibility. Oakland already has Barney's Burger, True Burger, Sparky's and a dozen or more established burger joints that are definitely upscale in relation to the many fast food burger joints dotting the East Bay. So King Kronner feels that only he can give Oaklanders the best burger via his Oakland Burger Paradise and to do so he needs to help destroy an important piece of Oakland Public Artwork. Because it would be too costly for them to find a better solution, Kronner and his cronies, Brandel and associates are trying hard to convince Oakland residents that water damage, black mold & crumbling walls were too much of a financial burden for them to shoulder, even with help from public crowd funding. I do believe that there are commercial building owners with less assets than Brandel, who have made major improvements to their properties knowing that their investments would be repaid through future rents and partnerships with tenants. i believe this is called foresight. As to the extent of the damage. Apparently the damage was due to a covered over window that was walled up for years. Since the rest of the wall is still intact the owners/tenant must have found a way to remove/halt the black mold from spreading further. Mold that was supposedly exacberated by recent rains. Was it the new construction/destruction that allowed the recent rains to pour into the walls.*5. Interesting that they were able to limit the damage to just the size of space that a new window will take up. The currently stark white/blue trimmed facade of the old J's, new Kronner's is just screaming out for a touch of color. Instead of a magnificent mural, perhaps Kronner would be more comfortable with a graffiti tagged business. More San Francisco edgy than the museum quality work of Rische-Baird. In the past I have enjoyed patronizing Cafe Trieste, but alas cannot envision myself spending my time and money in an establishment who's owner cares not a wit about the art, history and citizens of the neighborhood that he is benefitting from. And as for Kronner's new restaurant, I doubt it will be worth all the hurt it has caused. May it R.I.P. sooner than later. Bottom line, when a new tenant/owner comes into a neighborhood and destroys much beloved works of art in a secretive manner, using "protective tarping" as a subterfuge and then expects the locals to swallow their story hook, line and sinker, they better be prepared to do a lot of bailing out lest their ship sinks before it ever sails. *3 Winemiller, however, paints a different scene. She says that she referred Kronner to a muralist friend with experience in restoration and indicated she was willing to kick-start a community fundraising effort to pay for the work, but that she never received a response. *4 “We did consider making some sort of announcement, but after the laughably aggressive interactions with the neighborhood association, it seemed like it would have just invited more problems and would not have been to anyone’s benefit,” he says. “Yes, it would have been nice for people who wanted to, to say good bye to the mural, but there wasn’t any realistic plan offered up to save it. A decision had to be made, because we needed to move forward … It’s a bummer that it’s gone, but there wasn’t anything that could be done. I did my best.” Chris Kronner. *5. Some residents, however, discovered late last week that the mural, which had been covered by a blue tarp to protect it from the rain, had been partially destroyed when a large chunk of the wall had been taken out to expose and reinforce a previously covered-up window. *Hal Brandel is a Member of 4 Musketeers S.P., LLC and holds active roles in eleven companies and inactive roles in five additional companies . 4 Musketeers S.P., LLC filed as a Domestic in the State of California filed on Monday, March 29, 2004. This corporation is approximately eleven years old according to documents filed with California Secretary of State. 4 Musketeers S.P., LLC also lists Walter Wright as Member. Hal Brandel is connected to other officers through these corporate roles. One of the top connections is CA1 . Unfortunately, the mural had been painted on a wall that had been improperly installed in 1961 by the then-tenant, J.O. Kirby, to replace a window that interfered with Kirby's plans for the space. In November 2014, a contractor working for the new tenant, Kronner Burger, opened up the wall from the inside and discovered that the wall was falling apart, leaking water, and basically ready to collapse, creating an imminent safety hazard. The owner of the building, Steve Eigenberg, told Steve Lydon of PANIL to contact Rocky Rische-Baird to see if he had any interest in repairing the wall, since Rocky had agreed to be fully responsible for the mural when it was originally painted. It is not clear whether PANIL was able to reach Rocky, who had since moved away from Oakland. After three weeks without any commitment from the artist, Mr. Eigenberg authorized the tenant's contractor to make the necessary repairs to the wall to eliminate the public safety risks. Given the fragile state of the wall and the size of the window opening, it was not possible to preserve the removed portion of the mural in one piece. The pieces were delivered to the family of Rocky's wife, who still live in the area. PANIL has make statements to the effect that Rocky wasn't notified about the potential removal of the mural. If this is true, it is only because PANIL was unable to track him down once it became clear that the wall was unsafe. PANIL has also asserted that they were, in their words, "stunned" to learn that the mural had been taken down. Again, this is disingenuous, since PANIL knew that the wall was in terrible condition and that it was up to Rocky to try and fix the problem. Given the atrocious and unsafe condition of the wall, the proposal for a crowd-funded solution was not realistic. Neither was the suggestion that Kronner work with a "muralist friend with experience in restoration," since the problem was not a damaged mural, but a crumbing and unsafe wall underlying the mural.